The bike trainer is one of the most needed indoor cycling equipment out there that allows you to keep up the workout in any condition as you like to do something with the treadmill. No doubt there are rarely the people who love indoor cycling, but during the winter the weather would be against you, as there would have some specific requirements for winter cycling. Unfortunately cycling in winter as not easier as we think. The freezy weather makes the condition totally uncomfortable for cyclists. That’s why better to go for indoor cycling to achieve the same health benefits especially in that condition. Honestly here a bike trainer comes to be a beneficial equipment to workout in your very own home. So firstly here I am about to shortly write for the kinds of bike trainers and their technical details. Literally, there are four kinds of trainers. 1– Roller Bike Trainer: The roller trainer is one of the handy trainer out there that features three cylinders where your bike would be settled. The resistance would be provided by the roller or any other resistance generation system of trainer like magnetic, fluid or wind. Although nowadays mostly the people prefer other kinds of trainers than roller trainers. 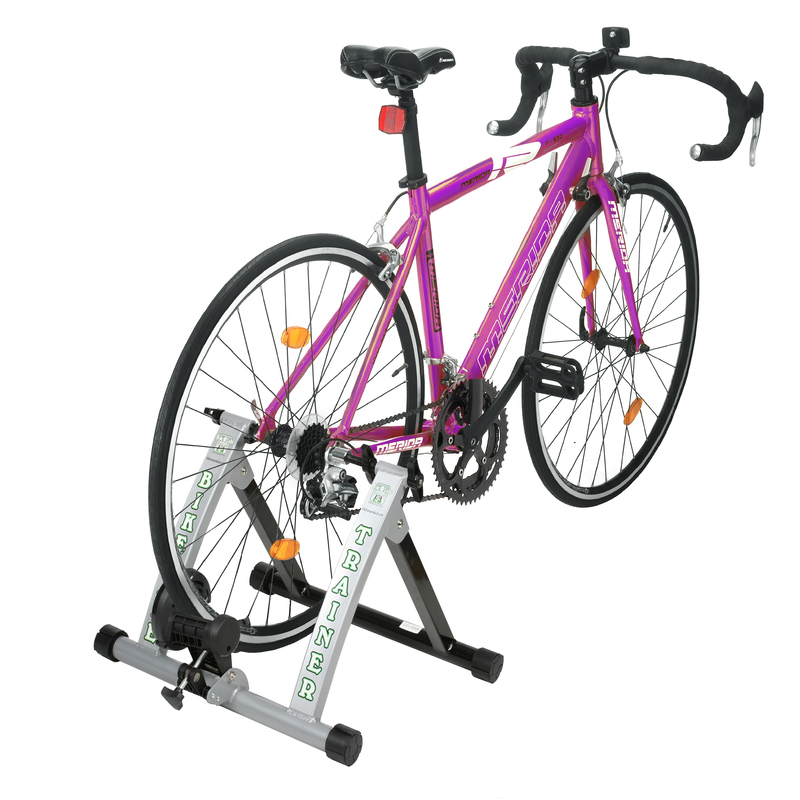 2– Magnetic Bike Trainer: It simply uses a magnetic flywheel to provide the resistance. Although it’s not too much noisy, but the limited resistance can bring some inconvenience for you. 3– Wind Bike Trainer: This is one of the realistic system of bike trainer that increases the resistance by the power of pedaling. When you spin the rear wheel the fan of the trainer starts rolling to provide the resistance. 4– Fluid Bike Trainer: It actually adds a fluid chamber with a magnetic flywheel that creates the resistance. It’s almost noiseless and amazingly great unless the chamber is being leaked. It would be expensive, but the limitless resistance power wouldn’t make you worried to gear up. What kind of trainers do you like most?, Now it’s your choice. But before going for a purchase you can consider few common things into a bike trainer. Durability— One of the major part of a trainer its durability. So look over the quality of the frame and the materials they used to build it up. Although mostly the trainers use steel material to build up the frame. Portability– The portability of a trainer can help you to easily carry it out anywhere. Mostly the trainer features foldable frames that not only help to make the trainer portable, but also allow you to easily save your space. Functionality– Before choosing your trainer, make sure how easily it can be operated. You can check the adjustment and resistance settings if you choose the magnetic trainer. Mostly the magnetic trainer features a remote lever to easily shift the resistance level. Noisy or Noiseless– It actually depends on the style of your trainer or what kind of trainer you choose. The budget also can make a difference here.